Passionately keen on all the rhythms, styles and musical genres of his native country, Argentina,​ Bordalejo follows an individual path, feeding on his exchanges with musicians, and works on sound matter and modes of play. 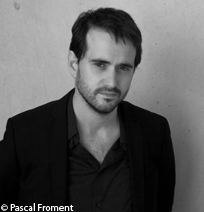 He particularly likes composing chamber music and ensemble works: Surveiller et punir for violin, cello and accordion, commissioned by the Cello Festival of Beauvais (2012); Zapping 2, first performed by the ensemble Court-Circuit (2013); En rappel for accordion, first performed by Vincent Lhermet (2014); Bureau 470, pocket opera for vocal quartet, percussion, violin, double bass, accordion and electroacoustics (2015); Hauteurs, a work written while on a research-creation residence on the SmartGuitare at the Collegium Musicae and at Ircam (2016); The magic phallus, pocket opera, first performed at the Music Centre of Budapest (2017); Fenêtrages_2 for percussion and piano (2018). Tomas Bordalejo teaches the classical guitar at the Gennevilliers Conservatory.